Geoconcept Universal Geocoder is a geocoding solution that enables addresses to be converted into geographical positions (x and y coordinates) or geographical reference (territorial identifiers such as commune, district,…) and conversely to find addresses from geographical coordinates (inverse geocoding / reverse geocoding). Geoconcept Universal Geocoder is an indispensable tool for obtaining reliable and accurate data, for various businesses : geocoding of client files, emergency callout locations, technical maintenance sites, business appointments, etc. Geoconcept Universal Geocoder incorporates the XML standard, which enables corrections to be archived during the interactive processing of errors as well as a French and foreign nomenclature manager which provides unrivalled geocoding performance irrespective of country. Be it town, district, street or house number, Geoconcept Universal Geocoder adapts to any type of geocoding. Geoconcept Universal Geocoder supports geocoding of more than 8 million addresses per hour with very high success rates. The solution adapts perfectly to every context where speed is important (call centre operations, calls to emergency services, maintenance callouts for equipment at risk…). Very easy-to-use, the solution features a number of assisted configuration stages. The user is guided step-by-step, receiving detailed information from wizards and help menus. He can therefore easily create customized reference tables. 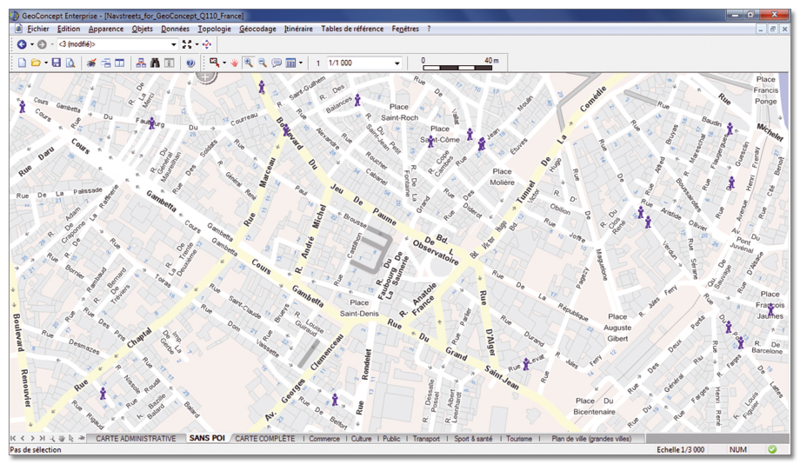 Geocoding becomes accessible to everyone, both experts and novices alike. Available as a standalone workstation and web version or as a web services solution, Geoconcept Universal Geocoder can be easily integrated into numerous application environments, thereby enabling web services to be implemented in Internet and Intranet architectures. It adapts to every kind of database and international grammar. Universal Geocoder Stand-alone : a stand-alone geocoding solution. Universal Geocoder Server : a multiplatform (Linux, Unix, Windows) geocoding web component enabling geocoding web services to be created and shared and geocoding put at the heart of the system. Universal Geocoder Builder : a kit making it possible to define the method and grammars used by the geocoder and to create its own address reference tables.